Are you planning an Easter brunch this year? 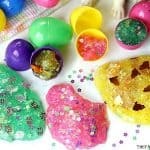 Or, better yet, are you wondering what to do with all that left over Easter ham? 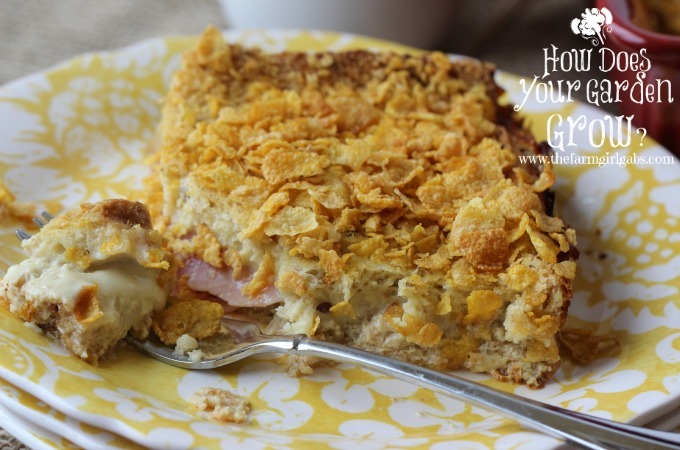 This Monte Cristo Sandwich Bake is the perfect solution! Easter is just around the corner. Hard to believe, right! Seems like we were just in the midst of Christmas dinner. 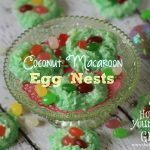 If you are planning on having the family over for Easter brunch, find you have a lot of leftover Easter ham that you don’t know what to do with or you simply need a menu idea for a weekend breakfast, this one is perfect! Brunch is always a perfect solution for holidays or a weekend when you don’t have to rush to get up and get out of the house. Monte Cristo Sandwich Bake is made the night before so there is no messy dishes on the day you plan to serve it. If you are a fan of the traditional Monte Cristo sandwich, then you need to try Monte Cristo Sandwich Bake. It’s a Monte Cristo sandwich in the form of a casserole. Hello yummy! This dish layered with bread, ham and cheese. As you know, ham and cheese is a classic combination…kinda like bacon and eggs. An savory egg mixture is then poured on top. The dish rests overnight so the egg mixture soaks into the bread. This allows the flavors to hang out and get to know each other. 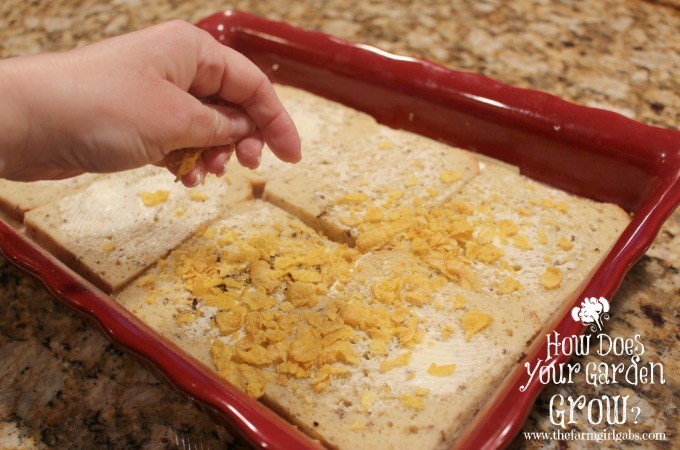 The dish is then topped with generous handful of crispy corn flakes right before baking. Personally, the corn flake crunch makes this dish. Oh, and I can’t forget the gooey melted cheese too. I used American for this one but I have used swiss cheese in the past. So in other words, use any type of cheese that makes you happy. Food is all about happiness, right! Are you planning a brunch soon? Or, wondering what to do with left over ham? 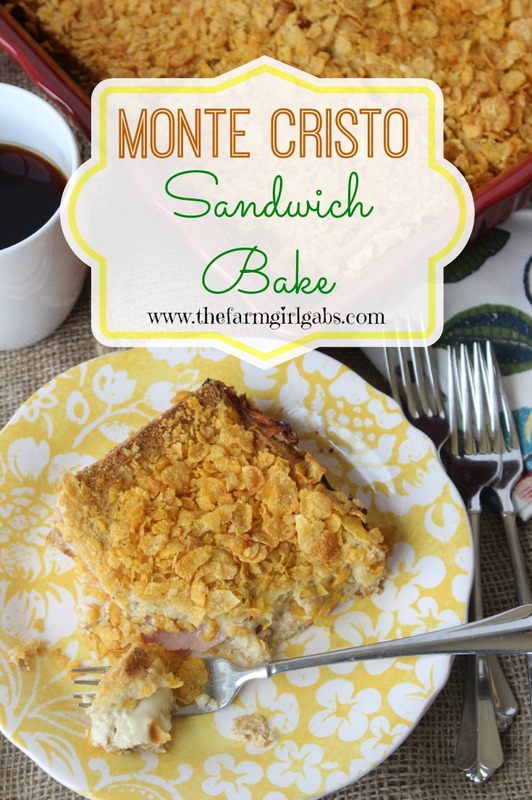 This Monte Cristo Sandwich Bake is the perfect solution! This ham and cheese casserole is a real crowd pleaser. Spray 13 x 9 baking dish with non-stick cooking spray. Trim crust off the bread and butter each side. Place 8 slices of bread on the bottom of the baking dish. Then, add a layer of ham and cheese. Top with remaining buttered bread slices. Mix eggs, milk, dry mustard, salt and pepper together. Pour over Monte Cristo Breakfast Bake and refrigerate overnight. 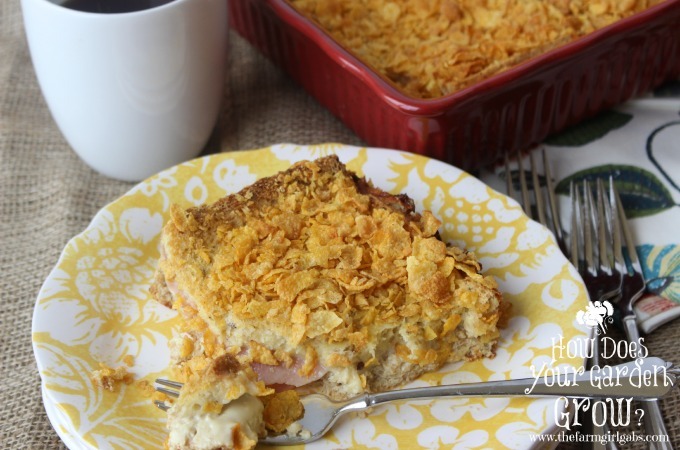 Top Monte Cristo Breakfast Bake with crushed corn flakes. My Breakfast Ideas board on Pinterest has a lot of great recipe suggestions. Be sure to check it out! Follow Melissa Russo | How Does Your Garden Grow?’s board Breakfast Ideas on Pinterest. I’ve never had a Monte Cristo! I’m pinning this as a great way to use up ham. That looks really good! I know my husband will probably love to try it! This looks so good, I will have to make it soon. Thanks for the recipe! This sound simply delicious! I think this will be perfect for breakfast/brunch the day of my daughter’s wedding to feed all the out of towners. In high school, we went to this French restaurant with French class and ordered a bunch of Monte Cristos. It’s been love every since. I love this twist!